Cops are investigating two more recent robberies in the Wrigleyville-Boystown area. And detectives have now identified a seventh hold-up connected to a two-night armed robbery spree in nearby Lincoln Park. A traffic aide found a 32-year-old man on the brink of unconsciousness near Addison and Magnolia around 10 p.m. on Wednesday. While he was being treated at Advocate Illinois Masonic Medical Center, personnel learned that he had been robbed before being discovered. Few other details are available, but the man said he lost $700 in the heist. A few hours later, another man told police that he was robbed by two men in the 3200 block of North Halsted around 1:45 a.m. Thursday. The victim, who was decked out in a suit and tie, told police that two offenders took $40 and his iPhone before they fled on foot. He said the offenders were two tall black men, 20-30 years old, and over 6-feet tall. They were wearing dark shirts and brown pants. Meanwhile, police late Sunday updated an earlier warning about armed robberies on the north end of Lincoln Park. The new alert lists a seventh incident that detectives now believe is connected to six other robberies that were committed on Monday and Tuesday. New to the list is a hold-up in Old Town at 4:40 a.m. Tuesday near the 1400 block of North Sedgwick. As in the other cases, a group of offenders approached the victim on the street and demanded valuables at gunpoint. The men threatened to shoot the victims if their commands were not followed, police said. Police say the offenders are four black men between 17- and 20-years-old. Their heights ranged from 5’2” to 6”4” and their weights range from 160-185 pounds. 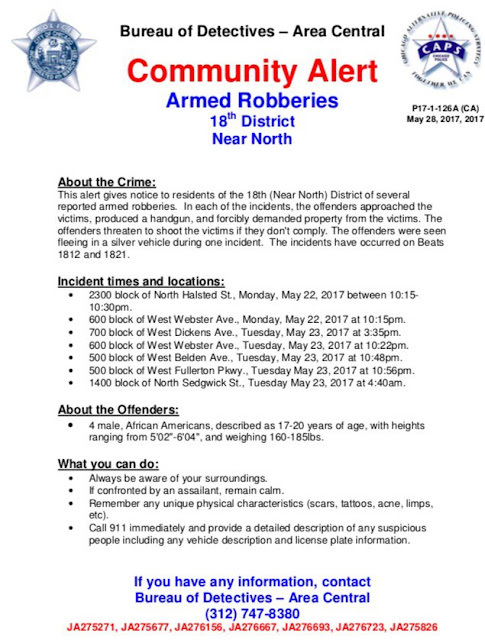 Anyone with information about the crimes is asked to call Area North detectives at 312-747-8380.